With Halloween and a Disney trip just around the corner I was in search of a costume that would fill both needs for Miss Stalin. She is not old enough to really be that interested in the princesses but she does know who Micky Mouse is. So it seemed like Minne Mouse was a logical choice. Then the searching began. There were thousands of options out there but I wanted to make sure that we got not only the best costume but also the best value. In the end I found Wholesale Minnie Mouse costumes at Wholesale Costume Club. I am very happy with this costume. 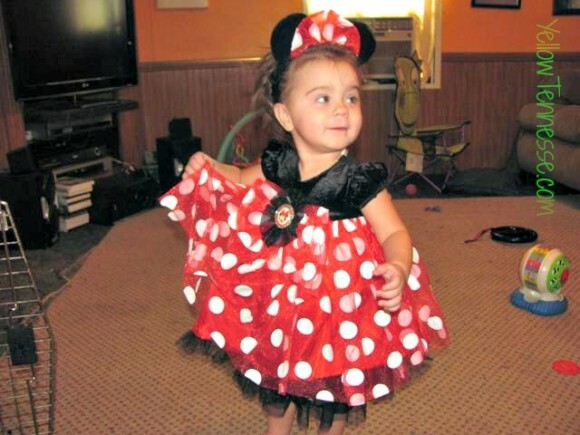 The actual dress is one piece and features a short black, bubble sleeved shirt with an attached red tutu. The tutu has white dots on it and black tulle peaking out the bottom. 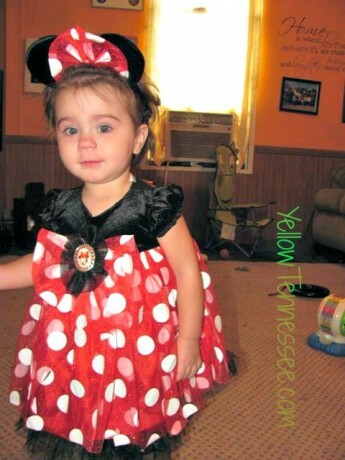 It also included a black headband with attached mouse ears and red bow. Miss Stalin is small for her age and at 19 months old has just hit the 20 pound mark. I did order her the 12 to 18 month sized costume and the fit is perfect. It is a little longer on her than I imagine it would be for most kids. It fits well around her chest and I am sure that we will get a few more months of use out of it. And of course she looks adorable in it. But Wholesale Costume Club has so much more than just Minne Mouse costumes. No matter what you are looking for, they are sure to have it.